Narrator: The noise upstairs didn't disturb the dogs that slept in the barn. They could sleep through anything. But a lot of the other animals were awakened by all the scurrying overhead. Some of them just accepted it... some were pretty annoyed... and a few quietly plotted revenge. Sure, the end result was a very cute movie, but now that I am a parent I would never allow my son to see this film. Every scene includes some horrible thing done to the animal 'actors' in order to get a particular shot. 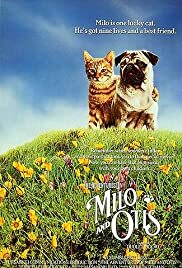 Cats and dogs thrown off cliffs into ocean breakers, riding down whitewater rivers in a box, chased by predators, shaking and wet and caked in snow... it really is a nonstop montage of abusive scenes. The movie was filmed in Japan so it did NOT have the American standard of animal supervision, and it is interesting to note that the disclaimer at the end does NOT say that no animals were harmed. I would never want my son to think that it was ok to treat animals this way, nor would I want to support the film industry in making films this way. The animals in this movie had no idea that it was all "just pretend" nor did they give consent. They probably thought they were about to die any number of times during the filming, and that is assuming that none did die, which I'm not too sure of. I think it is important to consider the moral ramifications before viewing this movie or showing it to children.